Is this good? Yes. Very good? Also yes. Brilliant? That too. 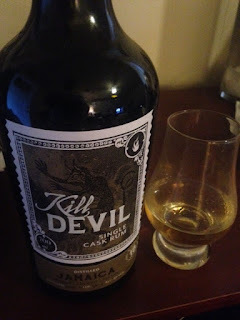 Frankly, I hesitate to tell you lowly peons about Hampden rum, because right now it's my little secret--well, Serge Valentin and Steve Ury get the credit, but still, the last thing we need is the venal vultures from the broken whisky culture preying upon the incredible values and gems in rum. Next thing you know, some middle-manager creep who works at an investment chop-shop in Manhattan will be clearing the shelves and flipping it on FB groups, while the other lemmings post similar crotch shots and I weep softly. OK, now to this bottle. It's awesome: moldy cigarettes, jet fuel, rotting mango, black pepper, old gym socks...it's just a huge blast of funk and fruit. I can't stop drinking it. Far better than 99% of the malts I've had this year. Why am I sharing this with the public? If I had any sense I'd just shut up. But this is ridiculous spirit and I have no self-control. 91 points/A-. Please don't buy it. Just stay away. Hunt Pappy and Stagg or flip re-filled bottles of Willett. Let me have this one corner of the spirits world, I beg you.